Cascading comets around a distant star. A mysterious darkening star might not be home to an alien megastructure after all. Instead, the dimming that apparently occurred over the course of a century may actually have resulted from how telescopes and cameras have changed over time, researchers said. Last fall, a star named KIC 8462852 made news when scientists found unusual fluctuations in the object's light. The star is an otherwise-ordinary F-type star, slightly larger and hotter than Earth's sun; it sits about 1,480 light-years away from Earth in the constellation Cygnus. But astronomer Tabetha "Tabby" Boyajian of Yale University in Connecticut and her colleagues, along with citizen scientists from the Planet Hunters crowdsourcing program, found something odd. They discovered dozens of strange instances of the star darkening over a 100-day period when they analyzed data from NASA's Kepler Space Telescope. So far, astronomers at the SETI (Search for Extraterrestrial Intelligence) Institutein California analyzing Tabby's Starwith the Allen Telescope Array have not detected any radio signals that would indicate the presence of an alien civilization. Scientists at SETI International in San Francisco and their colleagues have also failed to detect any laser signals from Tabby's Star. Still, in January, astronomer Bradley Schaefer of Louisiana State University reviewed archived photographic plates of the sky taken from 1890 to 1989 and found signs that Tabby's Star had dimmed by about 20 percent over the past century. He noted that this finding was difficult to explain by natural means. For instance, Schaefer calculated that it would require 648,000 comets, each about 125 miles (200 kilometers) wide, passing by the star in the past century to cause such dimming. Now, however, researchers suggest this seemingly century-long dimming trend might not be real. Instead, the apparent darkening may just be due to how astronomical instruments have changed over time. In the new study, scientists pored over DASCH (Digital Access to a Sky Century @ Harvard) data. This is a collection of more than 500,000 photographic glass plates taken by astronomers at Harvard in Massachusetts between 1885 and 1993 that the university is digitizing. "It is exciting that we have these century-old data, which are incredibly valuable for checks like this," study lead author Michael Hippke, an amateur astronomer from the German town of Neukirchen-Vluyn, told Space.com. The researchers looked not only at Tabby's Star, but also at a number of comparable stars in the DASCH database. Results showed that many of these other stars experienced a drop in brightness similar to that of Tabby's Star in the 1960s. "That indicates the drops were caused by changes in the instrumentation, not by changes in the stars' brightness," study co-author Keivan Stassun at Vanderbilt University in Nashville, Tennessee, said in a statement. "Now, what does that mean for the mystery? Are there no aliens after all? Probably not," Hippke said in an email. "Still, the daylong dips found by Kepler are real. Something seems to be transiting in front of this star, and we still have no idea what it is." 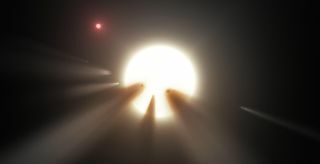 The best explanation so far for this dimming may be that a giant comet fragmented into thousands of smaller comets that are now crossing in front of Tabby's Star, some scientists say. To help solve this celestial mystery, amateur astronomers around the world are working with the American Association of Variable Star Observers to find new dips in the star's brightness, Hippke noted. Other groups, such as the Las Cumbres Observatory Global Telescope, have also joined the effort, he said. "Observing further dips in different colors can reveal information about the chemistry of the transiting object, which might confirm or reject a cometary origin," Hippke said. The scientists will detail their findings in the Astrophysical Journal.